Directions: Anyone who drives a motor vehicle on public streets or highways in Minnesota must carry a valid and unexpired driver’s license. If you have never had a driver’s license in any state or country, you must pass a knowledge test and a vision test, apply for an instruction permit, and pass a road test. The knowledge test for your learner's permit is based on information contained in this driver’s manual. To pass the knowledge test, you must demonstrate a basic understanding of Minnesota traffic laws. If you answer at least 32 questions correctly from the sample tests provided here you will be well prepared to take the knowledge test for your learner's permit. To complete a turn safely, you should activate your turn signal three to four seconds before your turn. When entering a roundabout, you must yield to pedestrians, bicyclists, and vehicles that are already in the roundabout. Makes you feel less confident. Begins to metabolize itself more quickly. Decreases the number of driving errors. As alcohol builds up in your system, it will slow your reactions, make you feel more confident, and cause you to make more errors. What should you do when an emergency vehicle is approaching while displaying flashing red or blue lights? See if you can reach your destination before the emergency vehicle catches up to you. Continue driving but try to stay out of its way. Pull over to the side of the road and come to a complete stop. Stop in the middle of an intersection. You must yield the right-of-way to all emergency vehicles using a siren, air horn, and/or flashing red, blue, or white lights. Where possible, you must pull over to the right edge of the road. If you are in an intersection, drive through the intersection before you pull over. Check your side and rearview mirrors. Before changing lanes, check your side and rearview mirrors for traffic approaching you from behind. Use your turn signal to let other drivers know you plan to change lanes. Check for other drivers who also may be moving into the same lane. Lanes of traffic moving in the same direction are divided by ____ lines. Solid white lines are used to separate lanes traveling in the same direction (as well as to mark the right edge of the road). Broken white lines separate lanes traveling in the same direction and may be crossed to pass. 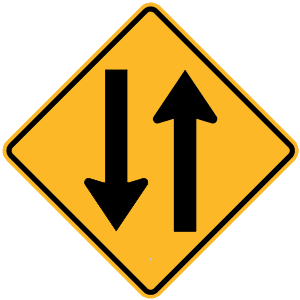 Yellow lines separate lanes of traffic moving in opposite directions.